Mitsubishi delivers on comfort and energy efficiency with ductless heating and cooling systems. 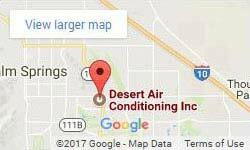 Desert Air Conditioning sells and installs Mitsubishi systems in Palm Springs and the surrounding Coachell Valley area. We offer everything from single-room solutions to whole-house, multi-room, multi-floor, ductless heating and cooling. These highly energy-efficient systems reduce the cost of your utility bills and save you money month after month! Mitsubishi systems are one of the quickest heating and cooling systems to install. Rather than connecting to a whole network of ducts, indoor units are strategically placed where they will work best around your home or office. Not being connected to ducts makes this type of heating and cooling far more flexible. They can be placed for maximum comfort, not just according to the design of the ducts. As an added bonus, Mitsubishi systems have air filters that actively help clean the air and improve the air quality in your home. HVAC systems rely on regular professional duct cleaning to keep the dust and pollutants from building up and being recirculated around a house. Mitsubishi heating and cooling systems require much less power to run, thereby saving homeowners on their electric bills. The delivery of temperature-controlled air directly into a room, rather than forced through ducts, delivers the right temperature where you want it. It does not have to be dispersed over large spaces where it will lose efficiency as it travels. These systems can all be connected by a single thermostat and set to control each room or region individually or as a whole. You save money by not heating or cooling areas no one is using. You can also set the thermostat to hold specific temperatures at certain times of the day and night. This minimizes the use of heating and cooling when no one is home, or while you are sleeping. Mitsubishi is one of the top, trusted brand names for quality ductless systems. Desert Air Conditioning has a wide range of options to fit your home or business. Call today to schedule a site visit and let us make suggestions for the best energy-efficient solutions. Our experienced contractors are happy to answer any questions you have and ensure you get the right system for your home and your budget. Don’t forget to ask us about our specials and our financing options. We have solutions to help every homeowner get the upgrade they need, even with no money down and no credit checks!